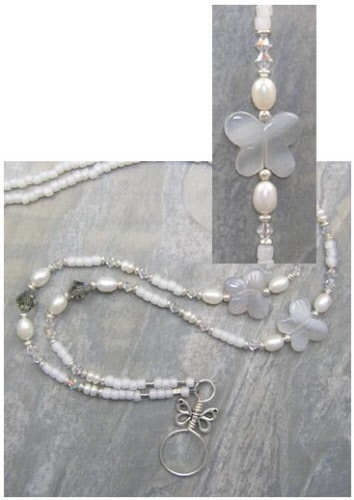 Natural gemstone butterflies with Swarovski crystals and cultured freshwater pearls accent these badge / eyeglass holders. 18G sterling silver wire and a pewter butterfly charm form the loop to hang your badge / eyeglasses from and measures approximately 1½ inches in length. A magnetic clasp has been added, to meet with OSHA standards, but should not be worn by someone with a pacemaker. All badge / eyeglass holders will be 30 inches in length unless otherwise specified.